My goal on this site is to include many samples of how to deal with grief. This page looks at the one that has been my favorite and continues to be meaningful for me--spending time in nature or with photos from nature. Our urban world keeps many of us separated from nature. During the first four years of my grief journey, I have made an effort to spend several hours in nature at least once a month. The rest of the month I relied on photos that I made during those outings. One of my favorite exercises came from Howard Zehr's The Little Book Of Contemplative Photography . When I feel myself in need of being centered, I scan through my photo files on my computer. I look for a photo that seems to be drawing me. On looking at a photo I reflect first on what I see, then on what I feel, and last on what I know or think in relation to the photo. Here is one of my photos followed by my journal reflection to help you get the idea. It may be helpful to know that this reflection was made three and a half years after my husband died. I may not have been so comfortable writing about accepting death as part of life in the early months. 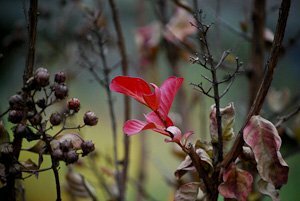 I see a cluster of bright red leaves surrounded by wilting and dying vegetation. The light is dim and gray. Leaves that had been green and then red are now dry with faded colors. There are empty leaf stems that remain from the already fallen leaves. There are some dark gray berries. This photo reminds me that there is beauty to be found in all seasons of life, even in dying. Death surrounds these leaves, yet they remain radiant and bright. I feel a sense of peacefulness as I look at this image. It helps me trust in the orderliness of the universe. I am calmed. This photo reminds me that many small deaths are a part of our daily lives. Our culture makes it easier for us to forget about death and push it away. I think that recognizing and embracing death is very much a part of living life fully. If I can embrace the small deaths of daily life, such as letting go of something I thought I really needed, I am more free to truly embrace the things that do give me life. This bright red bundle of leaves reminds me that I can let go with dignity and trust. Perhaps I understand a little more how to deal with grief and how to find glimmers of joy and radiance. For many people a scrapbook journal is a blank journal book, while writing and gluing in photos. These days, with all my photos being digital, I prefer digital journals. I scroll through my photo files and find the photo I want to use for journaling. Then I upload it into my digital scrapbook software and do my journaling there as well. With My Memories Suite you can print these pages from your home printer as you go along. So you get the best of both worlds--easy access to your digital photos, with a printed journal to browse back through.